Increasingly, users expect their data will never be lost. From using web apps like Google mail to storing files with services like Dropbox, it is easier than ever to keep your data forever. However, what about surveillance video? How common is it for surveillance video to be protected against hard drive loss? In this report, we provide statistics and insights from 100 integrators around the world on their approaches to protecting surveillance storage. Historically, using RAID for video surveillance has not been common. With relatively large storage amounts at debatable levels of value, the cost of providing redundancy was often significantly more than could be justified. On the other hand, the cost of RAID has clearly dropped and its availability in common products is increasing. Do these trends now reach a point where the majority or most everyone in surveillance is using RAID? What percentage overall of video surveillance installs are using redundancy/RAID? How does that support break down among integrators? How does IP camera adoption impact redundancy/RAID usage? 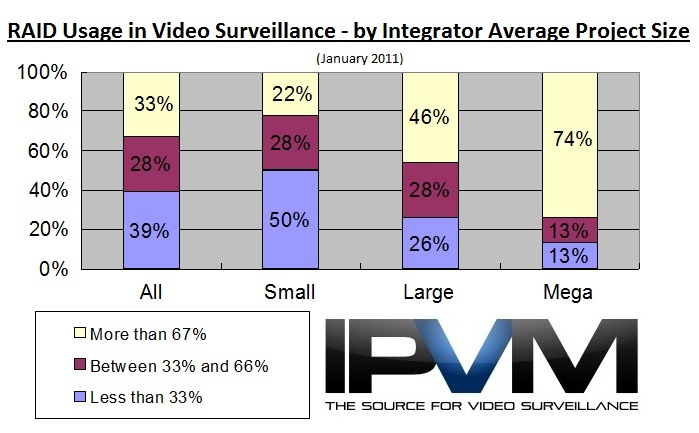 We compare adoption amongst integrators using 80%+ analog camera, 50%+ analog cameras, 50%+ IP cameras and 80%+ IP cameras. How does system size impact redundancy/RAID usage? We compare adoption amongst integrators who typically deploy less than 8 cameras to those who typically deploy more than 20 cameras and those who typically deploy more than 50 cameras? Respondents were close to evenly split on RAID / redundancy usage in their current video surveillance projects. 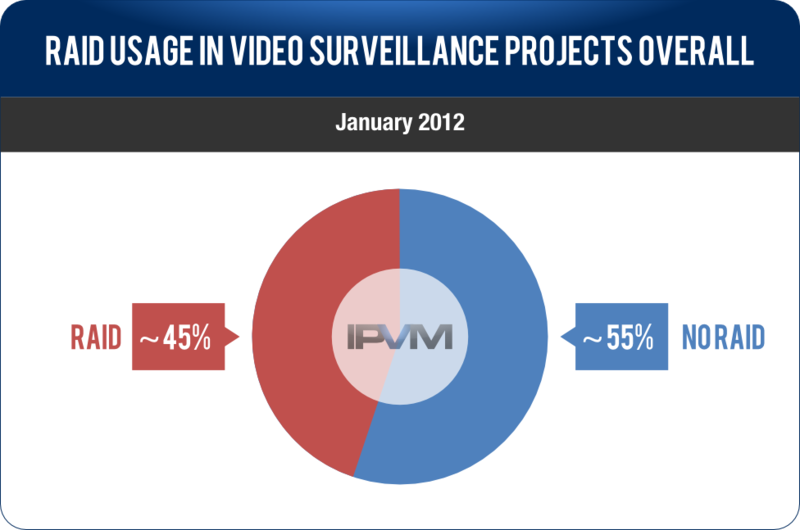 Overall, we estimate that slightly less than half of new video surveillance projects are using RAID. We suspect that over the past 5 years, RAID usage has increased dramatically as historically use was uncommon. The most common reason given for not deploying RAID was cost. Drives for redundancy and RAID controllers are both added expenses which many systems especially cannot absorb, especially in smaller systems, which often are more accepting of lost video better than larger systems with more intense requirements. "We tend to offer no redundant storage as unfortunately people don't want to consider the what if scenario and tend to go for the cheaper option." "Cost is a huge factor. Raid especially when you get into the double digits in TB's require a hardened server in a large enclosure. This drives up the cost quite a bit." "Usually only use RAID when using an external storage chassis. This would be an interesting debate. Video is important, but not as important in many cases as a spread sheet or customer database. Most cases when we've had to reformat or replace a drive, in small environments of 16 cameras or less, losing existing video of 15 to 30 days has not been a big deal to the customer, provided there wasn't something they wanted to save. Larger installations inherently put more importance on saving video, and you tend to need external arrays for those, which inherently use RAID." "I am small integrator and most of my customers do not want the added expense and their data is not mission critical." "Redundant storage is explained to customers and they decide if they want it. It's a cost/benefit scenario that varies depending on the end user, their previous experience (if any) and the importance of the data they are recording. Most customers in our target are more concerned about cost than redundancy." "With smaller storage requirements (2-4TB) those are the smaller jobs that are very price sensitive. Using RAID Storage, the additional cost would definitely add to the difficulties of getting that customer to sign the job. Also, small customers like this unfortunately dont usually care about redundancy for recording. If the HD fails, they just replace it with a new one. Anything larger, we use RAID 5." On the flip side, integrators who installed RAID 67% of the time or more answered that video is too important to not use any form of redundancy. Even some of the respondents who rarely installed RAID agreed that generally customers who don't see the value in RAID often regret this decision the first time a drive failure causes lost video. "RAID architectures are more 'forgiving' for service reasons. If a hard drive fails in a non-raid architecture, the customer isn't recording and is in a bind. If a disk fails in a RAID environment, we can typically get the drive replaced before the customer ever loses recording capabilities. The extra cost is an insurance policy against damage to our reputation." "Generally use RAID5 to provide resilience for video recordings. This is the most cost-effective way to provide resilience." Small deployments often see this as an added cost and it isn't incorporated into design. (Until a HDD failure loses them some video. THEN they buy it.)" "We use at least RAID5 on storage 95% of the time. The other 5% are smaller entry level commercial systems. We typically use RAID5 or RAID6 in DELL R410, 510 or 710 servers which typically gives us time to respond to issues without the loss of data. RAID5 in smaller 410 & 510 configurations where there are only 4 drive bays and RAID6 any time we get over 10TB storage (or over 150mbs processing) because it takes less of a performance hit on drive failure (and 2 drives can be lost)..."
"Would good is a surveillance system if you have no proof of the incident due to hardware failure? We believe in high availability, minimal downtime." "Most customers don't want any down time. Also if we have a support contract with the customer, we would be responsible for the system rebuild. RAID makes recovery from a bad drive a trivial support event." "Most of our clients view video as critical infrastructure, and loss of video could have a negative impact on their business. A most recent example: a new car wash deployed 12 megapixel cameras, 6 of which captured images of cars before and after they entered the car wash. Three days later a customer comes in and files complaint stating the car damaged her car. The video was available proving the damage was done after the car left, saving the owner litigation costs. Based on past experiences, the owner estimates the video saves him $5000/year, easily justifying the additional cost of a RAID array." "The drive WILL fail when you need it most and then your customer will wonder why they purchased a system that did not produce video when needed." In smaller systems, cost is often a major factor, leading to options such as RAID being some of the first concessions to be made to reduce the overall price of the system. Larger systems are often deployed in more critical applications with more stringent requirements. In high-security private sector or government applications, lost video is simply unacceptable. Thus, not suprisingly, some sharp differences arise when comparing trends by system size. For those deploying 20 cameras per site and below, 50% answered that they deployed RAID 33% of the time or less. Of those deploying more than 20 cameras per site, this number falls to 26%, a sharp difference. The converse is also true. 45.65% of those deploying more than 20 cameras per site answered that they deploy RAID 67% of the time or more. Only 22.22% of those deploying fewer than 20 cameras answered the same. The most stark contrast in respondents comes when we compare the segments based on whether they are installing more IP or analog cameras. Of those respondents answering that they are installing more IP than analog cameras, 40% say that they are using RAID more than 67% of the time. 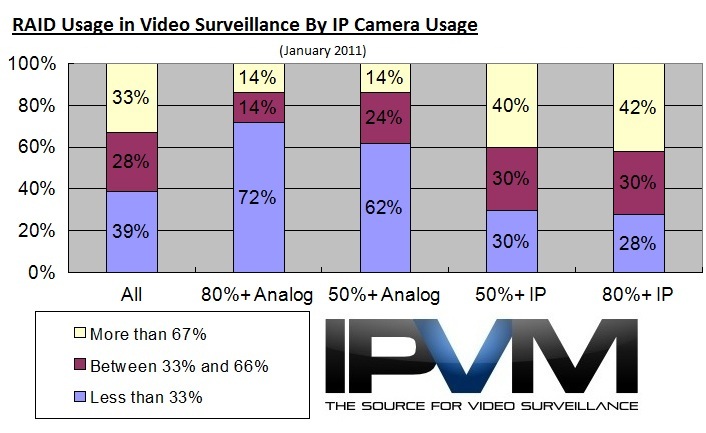 Compare this to only 14% of respondents installing more analog than IP cameras. Conversely, only 30% of those installing more IP than analog cameras say that they use redundant drives 33% of the time or less, compared to a whopping 60% of those installing more analog than IP. While RAID capability is available in analog DVRs, it is rarely offered standard or even on-board, often requiring expensive external RAID units. Server-based VMS systems are much more likely to incorporate RAID, as it can be implemented when the server is configured relatively inexpensively compared to add-ons to analog systems. While cost factors are likely some of the factor, markets served need to be taken into consideration, as well. The majority of those answering that they are installing more analog than IP cameras named retail, small business, restaurants, and clubs, etc., as their main markets. These typically have much lower budgets and expectations than government or large business accounts, leaving redundancy as an option, not a need.